Guest Bloggers: Simple Simon & Co.
We are Elizabeth and Elizabeth (liZ), two girls who married brothers and ended up with the same name. Besides sharing a name we also share a love for all things vintage, an addiction to sewing, and an adversion to having our pictures taken 😉 We are both former school teachers, each have three children, and together run a blog where we share all the projects that we create for ourselves and our families. Our similarities (and our differences) make us a good team– even if we drive our husbands crazy with all our crafting escapades. We started our blog a little over three years ago, first to share what we were making with each other – but soon decided to share those same projects with others. It has been such a rewarding and thrilling adventure to meet sewists from all over the world and to collaborate with such a great sewing community. It’s our very favorite thing about the blog! Our sewing backgrounds differ quite a bit, so we feel that we can relate to quite a few different types of sew-ers out there. Elizabeth realized early on that she loved to sew and learned from great Home Economic teachers and a sewing mom. She later stopped when high school began and sewing wasn’t “so cool” but was thrilled to find it again in life after her first baby was born. liZ, on the other hand, cried when she was given a sewing machine for Christmas one year and it wasn’t until her mom dragged her to a quilting class that she discovered her passion for fabrics and sewing. The good thing is that we have both found our genuine love for sewing and have never looked back! At Simple Simon and Co. we love to share sewing projects that are simple but have a lot of great style. One common project that we both love to sew are simple, but great-looking skirts. We like them because they are usually nap-time projects and they are things that our girls will actually wear and love (which is always a bonus)! 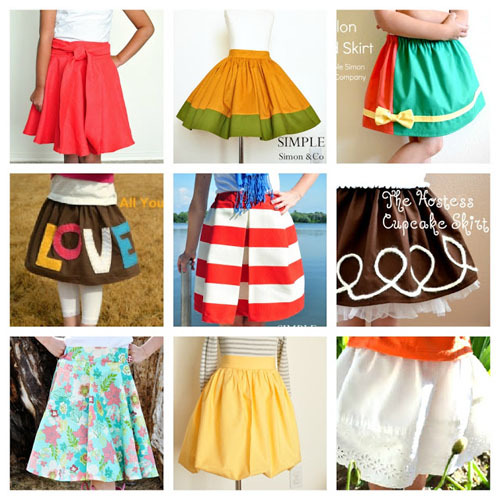 Here are some of our favorite free skirt tutorials that we have shared on our blog over the years…. Watch for an exclusive tutorial for WeAllSew coming soon. Meanwhile, we’d love to meet you sometime over at Simple Simon and Co! Next Next post: Sunrise Baby Quilt: Piece Those Strips!